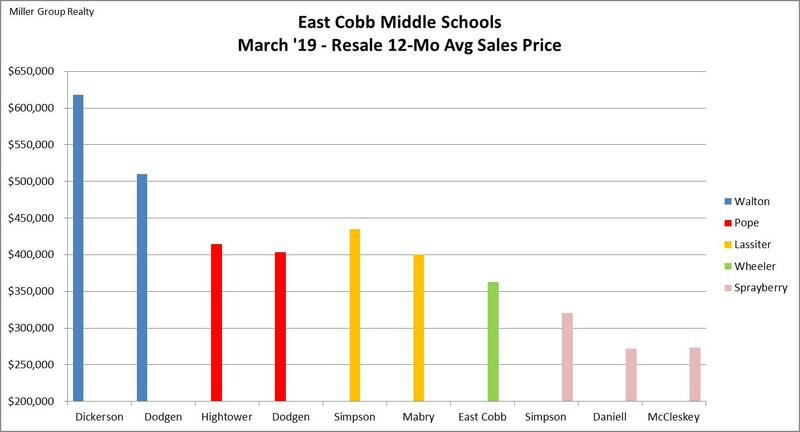 Miller Group Realty serves the East Cobb and fringe areas, focuses on the Walton High School local market, and specializes in the higher value homes (generally over $600,000) within just four elementary schools (East Side, Mount Bethel, Sope Creek, Timber Ridge) that feed Walton High School. Our clients benefit most when we are able to apply our Best Home Marketing approach to selling and are also hyperlocal. What happens in the Walton High School area generally follows the Atlanta metro trend of steady increasing activity as the new year begins and then starts to decline about mid summer. The following charts also demonstrate that the percentage of $600,000+ listings varies across Active, New and Sold categories. MGR defines a False Start as a Withdrawn or Expired listing; an Active, Pending or Sold listing that has introduced price changes; and an Active listing that has been on the market longer than the average days on market experienced by Sold listings that did not incur a price change. False Starts almost always have a huge negative impact on days on market and net at closing. It is also associated with Seller Fatigue which prompt the seller in exasperation to stop negotiating an offer, accept a low offer, or surrender pulling the property off the market (Withdrawn Listing) or cease the sales effort after the listing has Expired. MGR prepares the seller and positions the property to thwart False Starts. As one might expect and shown below, the frequency of False Starts generally increases as property values increase. 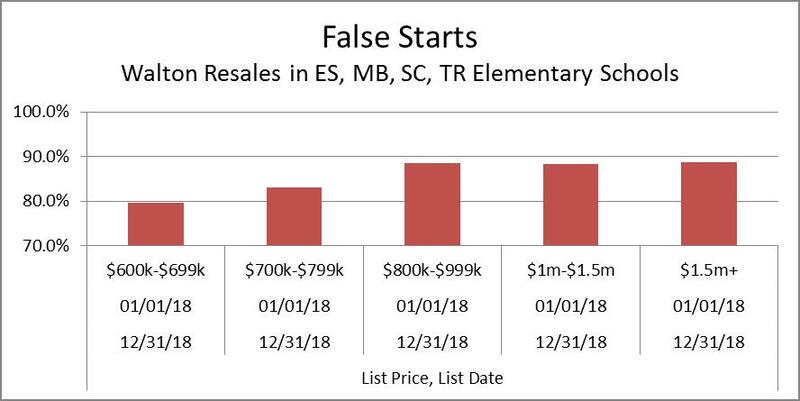 Sellers proclaiming they sold in days for their asking price are most probably the few who have been fortunate enough to avoid a False Start. What happens on the national scene, in metro Atlanta, Cobb County, within a ZIP Code, and even in the Walton High School district is of interest, but not nearly as important as what is occurring in the micro markets and within various price levels. In keeping with this reality, most of the following data is broken down by elementary school and then price range. Wide variations will occur with fewer data points, which is why a hyperlocal Realtor with “intellectual property” is so important to correctly interpret the information to avoid False Starts when initially launching a new listing. IMPORTANT – Contact the Cobb County School District before purchasing a home to verify the school assigned to a specific address. In the interim, the Online School and Bus Locator may identify the correct schools. 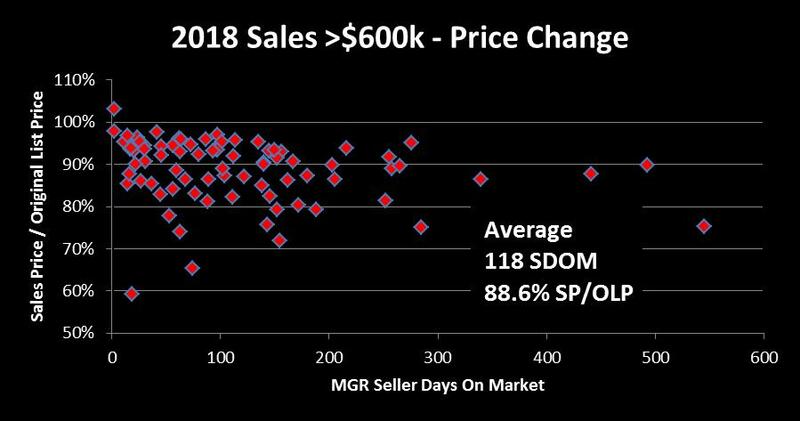 The following charts illustrate the negative impact of over pricing a new listing; i.e., more days on market and the necessity to make price reductions to prompt offers. 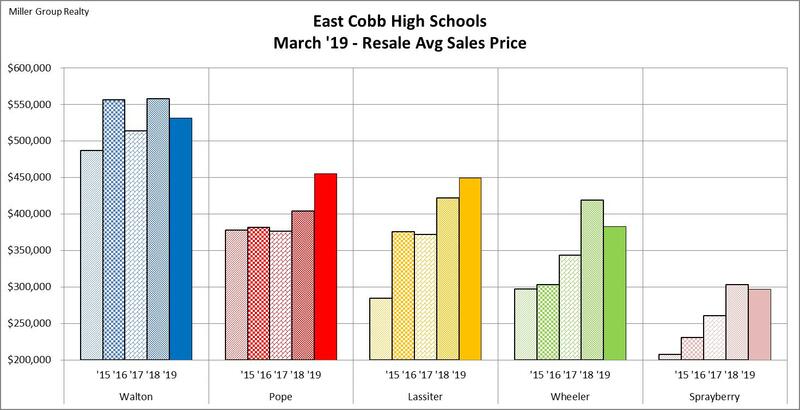 The data points below represent every Walton resale (new construction excluded) listing in the East Side, Mount Bethel, Sope Creek and Timber Ridges elementary schools that sold for $600,000+ for the period indicated. 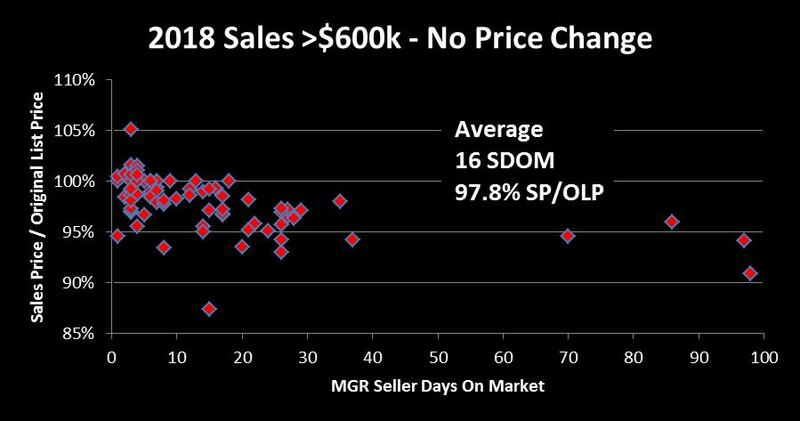 Notice the difference in the Sales Price / Original List Price ratio and MGR calculated Seller Days On Market when no price change was needed. Choose Miller Group Realty to leverage the Best Home Marketing approach to selling higher value homes and give yourself the best opportunity to net more in less time!